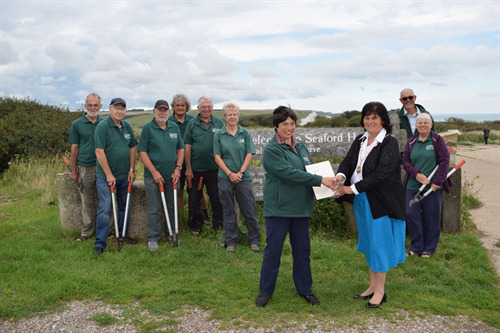 Seaford Town Council and Sussex Wildlife Trust have joined forces to secure the future for Seaford Head Nature Reserve. They signed a pioneering lease passing the care and management of this important site to Sussex Wildlife Trust for the next 25 years. The lease includes an annual payment from Seaford Town Council to Sussex Wildlife Trust to ensure that funds are in place to properly manage the reserve. Sussex Wildlife Trust Ranger, Sarah Quantrill, will continue to manage this site working closely with Seaford Town Council to ensure the rare wildlife and specialist habitat is protected and enhanced. Seaford Head Nature Reserve includes rare species such as the potter flower bee and moon carrot. The beautiful green winged orchid flowers in May and during the spring and summer the songs of stonechat, skylark and whitethroat fill the air. The Reserve is visited by thousands of people every year, many of whom are passing through to walk the Sussex Coast or Vanguard Way walks or to visit South Hill Barn. People come from all over the world to enjoy the spectacular view of the world famous Seven Sisters and Coastguard Cottages - best seen from the Nature Reserve. Anyone wanting to know more about the Reserve can pick up a leaflet from the Tourist Information Office in Seaford at 37 Church Street or can get more information from www.sussexwildlifetrust.org.uk or the Nature Reserve page on the Council's website. Seaford Town Mayor, Councillor Linda Wallraven (forefront right) and Sussex Wildlife Trust Chairman, Carole Nicholson, shake on the new lease watched by Sussex Wildlife Trust Ranger, Sarah Quantrill (left of centre), and some of the local volunteers.